Growing up, I always knew I wanted to just be a wife and mother. I never had any career goals even though we were “supposed” to have them. (Aren’t jobs or careers for men so they can provide for their families?) I had every intention of marrying a man who wanted me to have children and be the one home full time with them. I didn’t ever want to be the bread winner of my future family so I was careful about marrying a man who wanted the same things that I did. We absolutely talked about it before marriage and Ken was fully on board. He had every intention of being the provider for our family and thankfully, he has been for 37 years. There are way too many women I hear about who are postponing marriage and having children for their careers. Then when they finally get married, their husbands want them to continue working since they make good money. Reality is proving that this isn’t good for marriage. Suzanne Venker wrote about this. “Nevertheless, the new reality of many women outpacing men educationally and sometimes financially has serious implications for marriage.” God created men to be the providers and women to be the keepers at home. This is His plan and nothing that men and women do today will every change this. 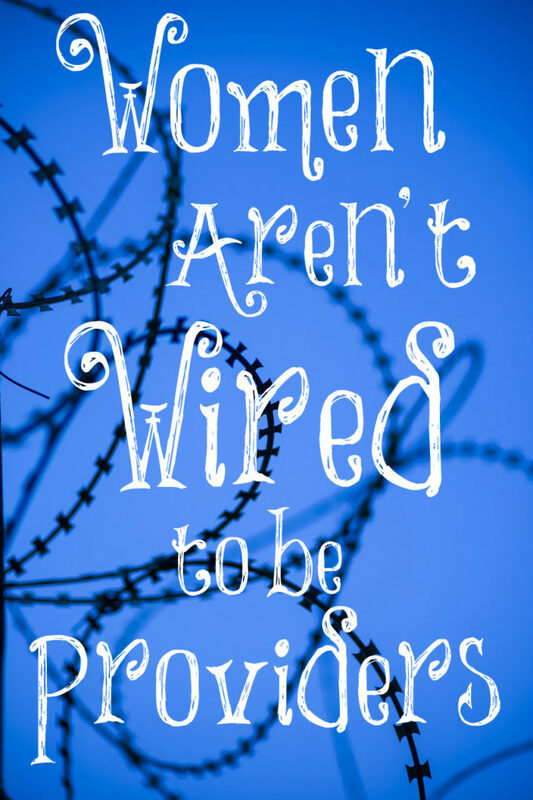 No, God did NOT wire women to be men. He didn’t wire them to be the providers. Our hormones prove this. Our physical build proves this. Everything about us proves that this is not our role in society no matter how hard feminists have fought to say that it is. They will NEVER outsmart God and His plan for us. Never. Even though many men want their wives to continue working because they see dollar signs instead of a mother at home with her children, it harms the marriage since the husband is last on the totem pole for the wife’s attention. She only has so much energy and most of her energy must go to her work to keep it, then to her children, then her home, and nothing is left for her husband. It’s too steep of a price to pay for extra money. Way too steep of a price. Men have ten times the testosterone for a reason. They are the ones created by our Creator to go out and “slay the dragons,” as Dr. Laura always used to say. Many women who try to do this eventually suffer from burned out adrenals and ill-health. Half of medical and dental school students are women these days. This is tragic for the women: for the men whose jobs they are taking away, for the lack of children they will be having, and for their future marriage. Stop the madness, women. Don’t pursue a high-powered career that makes a lot of money. Marry a godly husband who wants to work hard and be the provider. “Hypergamy (the preference of most women to marry ‘up’) doesn’t exist because women are greedy. (Well, some are, I suppose; but that’s a side issue.) It exists because pregnancy, childbirth and the needs of babies invariably make women vulnerable.” This is what God intended and there’s nothing wrong with it but everything right. Bearing and raising godly offspring while being keepers at home is what children, husbands, and this culture needs more than anything else. Unto the woman he said, I will greatly multiply thy sorrow and thy conception; in sorrow thou shalt bring forth children; and thy desire shall beto thy husband, and he shall rule over thee. And unto Adam he said, Because thou hast hearkened unto the voice of thy wife, and hast eaten of the tree, of which I commanded thee, saying, Thou shalt not eat of it: cursed is the ground for thy sake; in sorrow shalt thou eat of it all the days of thy life. When I was young, all I wanted to be was a wife and a mother.However, I was pushed to get the best possible education (I was afraid that l would not marry). Worst decision ever. During college I met my husband. We finished college, moved in together (by that time, I was Christian only in a very superficial level) and got married. I worked for a while. Because of various circumstances, I stopped working. Now my husband wants me to work again part time. He says that’s unfair that he should be the only one working and that I should start contributing. It’s not really about money (I would earn very little), more about the unfairness of this situation. If I share the burden of work, he will help with cooking and cleaning. He wants a more equal marriage. Not in the rabid feminist sense (with the spreadsheet to meticulously track each spouse contribution), but certainly not like it’s right now. I am disappointed because I don’t want to work and I would have preferred to wait until our child was in school. But my husband wants me to work and he says that if I really hate I can always quit, but I should work like anyone else. In this time, he says, there is no reason for a woman not to work (unless there are disabled children or some other extreme circumstances). I actually know of a solid, legitimate work from home job with good incentives that I’d love to share with you. (It is not selling anything). I don’t want to make Lori’s blog a commercial but perhaps if you care to know about it I can send Lori the information or my e-mail to share with you. M, I am interested. We could use the additional income and I would like some “play” money for coffees out, lunch with friends, etc. without feeling guilty that I am taking from more important things. I am fine with you sharing it on my blog, M! Would love to know more about it as well M.
It is teaching Chinese children English on-line. I just got hired on with them myself so if anyone feels like it is a good fit for your family let me know (I’d actually get a recruiter fee). If you have any questions check them out on YouTube. The great thing about them is you can live anywhere in the world so long as you are a native English speaker (although they may only want certain accents, I’m not entirely sure). It is part time contract work and the pay ranges from $16-$22/hour depending on creditials and incentives. Thanks for the thought, but I’m not American (and I don’t live in the US either), so it’s likely impossible for me. But thank you for the kind intention, I appreciate it. I am interested in this as well, as neither I or my husband wants me to go to work but we could use the extra income if I work from home. I’m sorry to hear your struggle 🙁 Is it possible for you to make an income through blogging or youtube? That way you can still stay at home and “contribute” to the household? What you are going through is one of my worst fears as a young single woman and I hope it works out for you! Plz keep us updated! As I said I’m not American, nor I live in the US. And, as you have probably noticed, I’m not a native English speaker either. Because of its size, if you have a niche business (for instance, you sell a particular product or service that very few people want to buy) in America, the niche is big enough to make a living. This is not true in other much smaller countries, like mine. With a bit of luck, I will find a part time job that will allow us not to change our child preschool arrangements (it’s not daycare) and still work. It will be physically hard and poorly paid (if you want a job with maximum flexibility, the choice is limited), but we will pay less taxes, because in this country the role of a stay at home parent is not valued, but punished. Apparently all life choices are valid, but not this one. I try to be positive and see it as an opportunity to get physically fit and maybe lose a little weight… however I only want to cry. I’m sorry that would not work for you. Your English is quite good and so I had not noticed that you weren’t a native English speaker. You can always consider teaching your language via Skype. There is a big demand (especially among the growing homeschool community) for live language lessons. In any case, blessings to you! Thanks, I’m flattered 😊. As a foreigner, my English is quite ok, however I am not a native speaker, so I can’t present my knowldge of English as my USP (unique selling point, in recruiters’ parlance). And unfortunately there is not much demand for my native language either, especially online. People tend to look for classes with a qualified teacher (which I am not) and make it a bit of a social activity, since it’s not an internationally language like English or Spanish. Anyway, thanks again for your kind words. Lori, could you share your sources for the studies you quote? I would like to read them in more detail. Thank you.